A pure, unfiltered hit of atmosphere can create moments that will be remembered forever. In Why I Love, PC Gamer writers pick an aspect of PC gaming that they love and write about why it's brilliant. This week, Tom stands on someone else's balcony and stares unmovingly at the horizon. This balcony from Westwood's Blade Runner adventure game is one of my favourite places in any PC games. It riffs on a scene from the film in which Harrison Ford, bruised and hugging himself in a towel, peers over the edge of his apartment balcony to watch the traffic. 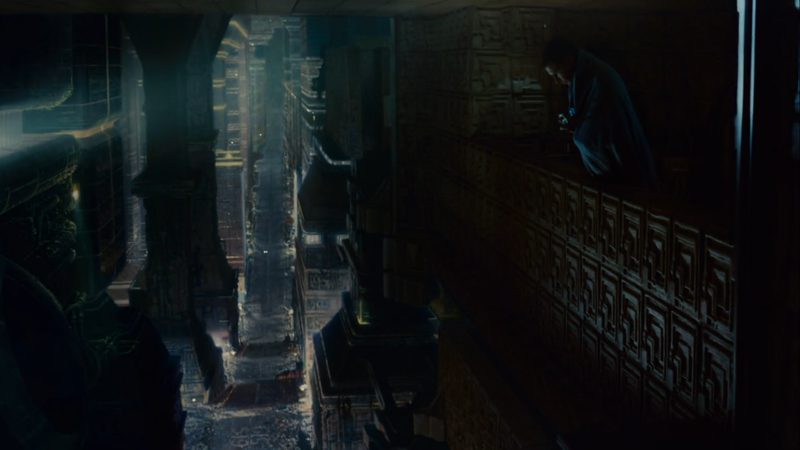 In both the film and the game, the balcony's purpose is purely atmospheric. You will find no clues or plot development, but pause there for long enough and the game seems to recognise that you're 'having a moment', and the score* score picks up. Games are generally quite good at giving us a good view for a few moments. The Bethesda RPG emergence moment when you crawl out of your cave into the world is an example. The Witcher 3 seems to construct postcards for you that you'll round on as you pelt along the game's dirt tracks. The balcony is different because it's a moment you've chosen, and the game responds with this audiovisual distillation of its essence, all its smoky, melancholy cyberpunk cool. Batman: Arkham City has its own version of this. Crime Alley, the place where Bruce's parents were murdered, is hidden away in Gotham. If you find it you can press a button to take a knee. The 'echoey voices from the past' motif is a little hokey, but it gives you Batman's past, a bit of pop psychology analysis, and creates a some heat for Batman's prime antagonists—Hugo Strange and the Joker—all in one minute of very efficient mourning. It's an elective moment of contemplation that brings me closer to the character, and the whole vibe of the game. A single red rose in a dark alleyway spotlights that know where emotionally significant events have happened, it's all very Gotham. I often wonder how much attention I really pay to game worlds while I'm actually get stuff done—completing missions, killing enemies. When concentrating on objectives and skill-based tasks, the game's ambience gets shoved to one side. I can't enjoy a sunset and kill a dragon at the same time. Until I can, it's these moments that endure in my memory, when the fights, platforming tasks and puzzles have all faded into the same blob of experience. I keep thinking of games that could benefit from such moments. Ever since seeing this Human Revolution concept art of Jensen enjoying a cigarette while crushing a glass of whisky, I hoped that would be in the game. A 'press E to lounge' command near his couch perhaps. Jensen lights a cigarette (or would he vape?) and pours a slug while the window slats open and Michael McCann's score warms the room. Mmm, now that's good cyberpunk. *This sounds exactly like Vangelis' original score, but it is in fact a near-perfect recreation created by the game's composer, Frank Klepacki.